Rain-fed lowlands are major agricultural ecosystems used for rice production in Northeast Thailand. Developing a tool to assess the effects of variable water conditions on the regional scale yield is also important to predict the effects of climate change on food supply. To estimate regional yields, we need a simple but accurate measure of the crop calendar (i.e., the distribution of planting dates), which has a strong influence on grain yield. In this article, we modeled the dependence of the crop calendar on rainfall patterns based on a survey of the region’s farmers as a part of an effort to provide a stronger basis for regional yield estimates. Our survey, conducted in 11 provinces for 2 years, confirmed the existence of large windows for sowing and transplanting versus narrow windows for heading and harvesting for rain-fed lowland rice culture in all the provinces. Variable water, soil, and toposequential conditions in the paddy fields were responsible for the large sowing and transplanting windows, whereas the use of photoperiod-sensitive varieties explained the narrow windows for heading and harvesting. The crop calendar was well expressed as a function of cumulative precipitation from June onward. When the crop calendar model was combined with a simple phenology-based model that uses growing degree-days adjusted by a day-length factor, we could estimate the rice crop calendar under rain-fed lowland conditions with acceptable accuracy. The model described in this article will be combined with a crop growth model to improve regional yield estimates for rain-fed lowland rice. 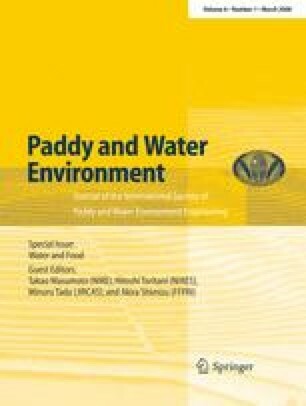 This study was financially supported by the research project of Ministry of Agriculture Forestry and Fisheries “Assessment of the impact of global-scale change in water cycles on food production and alternative policy scenarios”.